Mexico City - Lewis Hamilton is relishing the battles to come in 2018 as a revived Ferrari, improved McLaren and determined Red Bull seek to derail his bid for a fifth world title. The newly-crowned four-time world champion made that clear in the aftermath of Sunday's Mexican Grand Prix, won by Red Bull's 20-year-old Dutchman Max Verstappen. Hamilton finished ninth in his Mercedes, but Sebastian Vettel's title challenge ended with him finishing fourth for Ferrari despite starting from the 50th pole of his career. The pair collided at the third corner of the first lap and both required lengthy pit stops that left them at the back of the field. Talking to reporters after the race, Hamilton said he was motivated by his battle with Vettel. "It's kind of cool to be in this battle with him," said Hamilton. "He got 50 poles and I don't want to give him any more poles because he gets closer to me. That's inspiration to keep pushing it - the same with wins, same with championships. "When I see him sign for another three years with Ferrari and I'm like 'Ferrari are not going to like me for the next couple of years'. "We're going to make it as hard as it can possibly be for them to win championships, but I really am looking forward to that battle with them." He added that he anticipated a similar scrap with Verstappen, the rising young star of the sport, who dominated Sunday's race for his third career win. "He's really the brightest young star that we've seen for some time," said Hamilton. "I hope that in his early era that I can be a good force and a good battle for him." The 32-year-old Briton added that he expected and hoped to be re-joining battle with his one-time McLaren team-mate, Spain's two-time former champion Fernando Alonso. 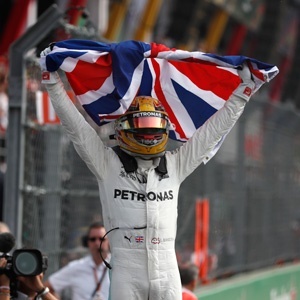 The pair had a dramatic tussle in the closing laps on Sunday as Hamilton fought to pass him. "Just wait until this guy gets a good engine, because the car was great through other sections and I really hope for McLaren, who have a special place in my heart, that next year is a better year for them. "I hope they have a stronger engine a stronger car. Fernando's a tough cookie. I enjoyed the little battle I had with him and I hope we get to have many more like that." Hamilton spoke before flying from Mexico City to Miami for a late night party in a club where he revelled with family and friends. He defended his lifestyle and said his 2017 title had been much tougher to win than many observers believed. "I'm different," said Hamilton. "People talk about Michael's (Schumacher) single-mindedness about his job, but to stand out in the world today is a lot harder because it's all been done before. "Doing something different that helps you stand out, that really highlights your individuality. "I think it's really important and that's really something I'm working on." Reflecting on his latest championship win, he said: "It felt challenging on a personal level. "This year is a championship, which I've been hoping for - a little bit like 2008, where you're fighting another team, fighting this historic team, which Michael raced for and won championships in. "I'm really proud of that and to be able to battle someone else who is a four-time world champion, a proven world champion, who's got great skill and a team also that knows how to win a championship. "That's how every championship needs to be, and I hope there's more championships like this one where we have this tough battle." He dismissed the theory that he won because Mercedes had given him the best car. "People have written that we've had the best car, but I don't believe we've had the best car. "I think we've been the best team. We've done the best job, but there have been times when we've not had the best car."